Bats represent about 20% of all classified mammal species worldwide, with about 1,240 bat species divided into two suborders: the less specialized and largely fruit-eating megabats, or flying foxes, and the highly specialized and echolocating microbats. About 70% of bats are insectivores. Most of the rest are frugivores, or fruit eaters. A few species, such as the fish-eating bat, feed from animals other than insects, with the vampire bats being hematophagous. Bats are present throughout most of the world, performing vital ecological roles of pollinating flowers and dispersing fruit seeds. Many tropical plant species depend entirely on bats for the distribution of their seeds. Bats are important, as they consume insect pests, reducing the need for pesticides. The smallest bat is the Kitti’s hog-nosed bat, measuring 29–34 mm (1.14–1.34 in) in length, 15 cm (5.91 in) across the wings and 2–2.6 g (0.07–0.09 oz) in mass. It is also arguably the smallest extant species of mammal, with the Etruscan shrew being the other contender. The largest species of bat are a few species of Pteropus and the giant golden-crowned flying fox with a weight up to 1.6 kg (4 lb) and wingspan up to 1.7 m (5 ft 7 in). Among ectoparasites, bats occasionally carry fleas, but are one of the few mammalian orders that cannot host lice (most of the others are water animals). Plecotus_auritus01Bats are natural reservoirs for a large number of zoonotic pathogens, including rabies, severe acute respiratory syndrome (SARS), Henipavirus (i.e. Nipah virus and Hendra virus) and possibly ebola virus. Their high mobility, broad distribution, and social behaviour (communal roosting and fission-fusion social structure) make bats favourable hosts and vectors of disease. Many species also appear to have a high tolerance for harbouring pathogens and often do not develop disease while infected. However, contrary to folklore, this is not true of rabies, which is as fatal to bats as it is to all other species. However, a bat may be ill with rabies for a longer time than other mammals. In regions where rabies is endemic, only 0.5% of bats carry the disease. In the United States, bats typically constitute around a quarter of reported cases of rabies in wild animals. However, their bites account for the vast majority of cases of rabies in humans. Of the 36 cases of domestically-acquired rabies recorded in the country in 1995–2010, two were caused by dog bites and four patients were infected by receiving transplants from an organ donor who had previously died of rabies. All other cases were caused by bat bites. Rabies is considered fully preventable if the patient is administered a vaccine prior to the onset of symptoms. However, unlike raccoon or skunk bites, bat bites may go ignored or unnoticed and hence untreated. Rabid bats are broadly distributed throughout the United States; in 2008–2010, cases were reported in every state except Alaska and Hawaii, and Puerto Rico. Rabid bats may be clumsy, disoriented, and unable to fly, which makes it more likely they will come into contact with humans. One should avoid handling them or having them in one’s living space, as with any wild animal. If a bat is found in living quarters near a child, mentally handicapped person, intoxicated person, sleeping person, or pet, living in an area where rabies is known to occur, the person or pet should receive immediate medical attention for rabies. Bats have very small teeth and can bite a sleeping person without being felt. There is evidence that it is possible for the bat rabies virus to infect victims purely through airborne transmission (“cryptic rabies”), without direct physical contact of the victim with the bat itself. If a bat is found in a house and the possibility of exposure cannot be ruled out, the bat should be sequestered and an animal control officer called immediately, so the bat can be analysed. This also applies if the bat is found dead. If it is certain nobody has been exposed to the bat, it should be removed from the house. The best way to do this with live bats is to close all the doors and windows to the room except one that opens to the outside. The bat should soon leave. 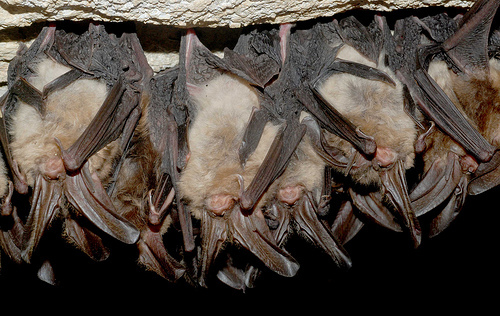 Due to the risk of rabies, and to health problems related to their faecal droppings in some regions, bats should be excluded from inhabited parts of houses. The Centers for Disease Control and Prevention (CDC) provide fullly detailed information on all aspects of bat management in North America, including how to capture a bat, what to do in case of exposure, and how to bat-proof a house humanely. In certain countries, such as the United Kingdom, it is illegal to handle bats without a license and advice should be sought from an expert organisation such as the Bat Conservation Trust if a trapped or injured bat is found. Where rabies is not endemic, as throughout most of Western Europe, small bats can be considered harmless. Larger bats can give a nasty bite. Bats are the number one suspected Rabies carrier. Fleas and ticks.